"The spirit of the Italian cuisine, hospitable, open widely to us all, is that of peasant cooking, of home cooking, of amateur cooking - amateur, from amarecooking with love." 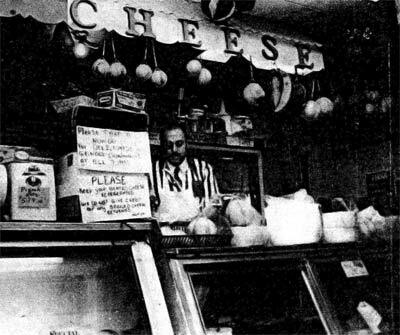 Cavallo of Cavallo's Town Plot Imported Italian Food prepares an order at his well-stocked cheese counter. Cavallo's Town Plot Imported Italian Food is a deli for all senses. When you open the door, a bell rings. From then on, it's a complete treat for mind and body alike. The fresh scent of breads and pastries warms the air, and Italian music dances from aisle to aisle. It's hard to pin down owner Vito Cavallo, always busy overseeing his larger store. Cavallo's is not new to Town Plot, having been very much a part of the neighborhood behind Our Lady of Mount Carmel Church ofr some ten years now. Cavallo's was not always the large, spacious store that now oc cupies the America Street building. Ex panding his store to include the space vacated by Mae's Bake Shoppe gave Mr. Cavallo the opportunity to reorganize and increase the depart ments in the store. A tour of Cavallo's takes one from seemingly endless aisles of imported pastas, tomato sauces and pastes down to the well-stocked deli. Cold meats are sold by the piece or slice. your dog needn't be of Italian extrac tion to appreciate the pet scraps also offered at the deli counter. Trays of an tipasto items also fill the cases, from marinated artichokes, mushrooms, easily a half døzen different types and sizes of olives, as well as salad dishes. Grinders, too, are a strong selling feature at Cavallo's, served up on hard, crusty Italian grinder bread, as are their special sausages. The cheese counter should prove to be a special source of pleasure. A wide variety of cheeses fill the counter and backwall cases, huge rounds and slabs and chunks. Should you find yourself confused by the choices of fered or unfamiliar with any of the types, samples are yours for the ask ing. Also, should you desire to have your cheese grated, that is easily done. It would be a good idea though to take a number for better service at the deli counters, especially on weekends and after Mass when this area of the store is especially active. The far side of the store features a well-stocked fruit and vegetable department, faintly reminiscent of farmer's open-air market. This area, too, is where the Italian pastries can be found. Of course zeppoles are on the shelves, as they are in most delis this time of year, but cannolls, rum babas, and other tasty, often alcohol-laced treats are also offered. Pignoli and other kinds of nuts, amarettini biscuits and a wide variety of traditional Italian cookies and candy are also stocked. Special to Cavallo's is a line of highly decorative, colorful pottery, statuary, and household accessories, including ornate marble phones, lamps and or naments - you'd think yourself at a tourist sight in Italia, where peddlers' carts often dot the area bearing many such items. Cavallo's offers much of the color and flavor of the old country to the seasoned shopper - one has only to look.